The first is, when the thing to be done is likely to be better done by individuals than by the government. Speaking generally, there is no one so fit to conduct any business, or to determine how or by whom it shall be conducted, as those who are personally interested in it. This principle condemns the interferences, once so common, of the legislature, or the officers of government, with the ordinary processes of industry…. The second objection is more nearly allied to our subject. In many cases, though individuals may not do the particular thing so well, on the average, as the officers of government, it is nevertheless desirable that it should be done by them, rather than by the government, as a means to their own mental education—a mode of strengthening their active faculties, exercising their judgment, and giving them a familiar knowledge of the subjects with which they are thus left to deal…. Without these habits and powers, a free constitution can neither be worked nor preserved, as is exemplified by the too-often transitory nature of political freedom in countries where it does not rest upon a sufficient basis of local liberties. The management of purely local business by the localities, and of the great enterprises of industry by the union of those who voluntarily supply the pecuniary means, is further recommended by all the advantages which have been set forth in this Essay as belonging to individuality of development, and diversity of modes of action. Government operations tend to be everywhere alike. With individuals and voluntary associations, on the contrary, there are varied experiments, and endless diversity of experience…. The third, and most cogent reason for restricting the interference of government, is the great evil of adding unnecessarily to its power. Every function superadded to those already exercised by the government, causes its influence over hopes and fears to be more widely diffused, and converts, more and more, the active and ambitious part of the public into hangers-on of the government, or of some party which aims at becoming the government. If Lady Grantham had not read Mill – her granddaughter Lady Mary said last night that aristocratic young ladies were taught only “French, prejudice and dance steps” – we can be sure that the show’s creator Julian Fellowes did. So three cheers for Julian Fellowes and his injection of Millian liberty into television drama. It’s interesting that the New York Times recapper noticed Lady Grantham’s speech, while the Wall Street Journal did not. A lot of Americans think it would be better to have a businessman than a politician as president, and I sympathize with them. Alas, the only businessmen crazy enough to run for president seem to be, well, crazy. At least Ross Perot kept his craziness confined mostly to private matters, such as the looming disruption of his daughter’s wedding. Donald Trump puts it front and center. Trump’s greatest offenses against American tradition and our founding principles are his nativism and his promise of one-man rule. Not since George Wallace has there been a presidential candidate who made racial and religious scapegoating so central to his campaign. Trump launched his campaign talking about Mexican rapists and has gone on to rant about mass deportation, bans on Muslim immigration, shutting down mosques, and building a wall around America. America is an exceptional nation in large part because we’ve aspired to rise above such prejudices and guarantee life, liberty, and the pursuit of happiness to everyone. Equally troubling is his idea of the presidency—his promise that he’s the guy, the man on a white horse, who can ride into Washington, fire the stupid people, hire the best people, and fix everything. He doesn’t talk about policy or working with Congress. He’s effectively vowing to be an American Mussolini, concentrating power in the Trump White House and governing by fiat. It’s a vision to make the last 16 years of executive abuse of power seem modest. Without even getting into his past support for a massive wealth tax and single-payer health care, his know-nothing protectionism, or his passionate defense of eminent domain, I think we can say that this is a Republican campaign that would have appalled Buckley, Goldwater, and Reagan. 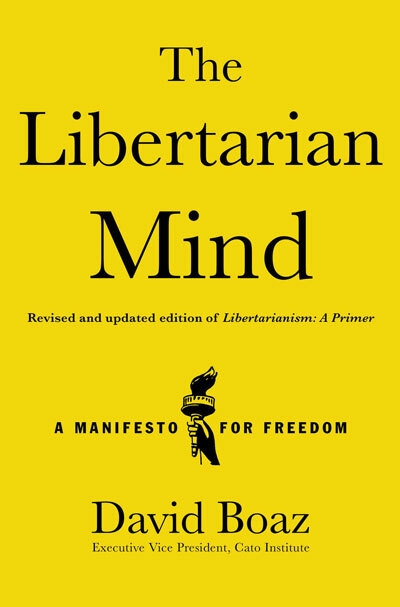 The symposium is understandably being described in the media as “conservative thought leaders take on Trump.” I of course consider myself a libertarian, as my book The Libertarian Mind would indicate, and not a conservative. But part of the impact of this symposium is that people of such widely varying views – I have a lot of disagreements with religious rightist Cal Thomas and neoconservative Bill Kristol – nevertheless regard Trump as dangerous. Not since George Wallace has there been a presidential candidate who made racial and religious scapegoating so central to his campaign. Trump launched his campaign talking about Mexican rapists and has gone on to rant about mass deportation, bans on Muslim immigration, shutting down mosques, and building a wall around America. America is an exceptional nation in large part because we’ve aspired to rise above such prejudices and guarantee life, liberty, and the pursuit of happiness to everyone. Equally troubling is his idea of the presidency—his promise that he’s the guy, the man on a white horse, who can ride into Washington, fire the stupid people, hire the best people, and fix everything. He doesn’t talk about policy or working with Congress. He’s effectively vowing to be an American Mussolini, concentrating power in the Trump White House and governing by fiat. It’s a vision to make the last 16 years of executive abuse of power seem modest. This isn’t my first sally against Trump. After hearing him in person at FreedomFest in July, I wrote about his nationalism, protectionism, and megalomania in the Washington Times. And in August I reviewed his support for and use of eminent domain at the Guardian. The National Review symposium was posted last night at 10 p.m., and I took note of it on Facebook and Twitter. It drew a lot of reaction. And I must say, I was surprised by how many of the responses, especially on Twitter, were openly racist and anti-Semitic. That did nothing to make me reconsider my deep concerns about the damage Trump is doing, and could do, to America’s libertarian heritage.